Not too long ago, SEMPO released its 2011 State of Search Marketing report. The data revealed about social media marketing continues to paint the picture that companies are still trying to figure out how the heck to get a handle on making social media work for them. 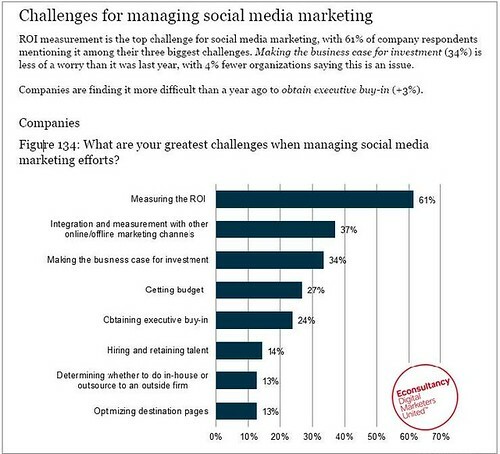 One graphic in the SEMPO report reveals the specific challenges companies are facing with social media marketing, which includes tracking ROI (of respondents, this is the biggest challenge), integrating social media with other marketing channels, obtaining buy-in and budget for social media and hiring the right talent for the job. Wanting to get to the bottom of how some of these obstacles can be removed, I turned to social media marketing extraordinaires Lauren Litwinka and Merry Morud of aimClear, to answer some of the burning questions many businesses have about social media. This in-depth posts delves into the challenges companies face with social media, and presents practical guidance on how to get a handle on social media for business. What are some metrics and tools that marketers can use to gauge the success of their social media efforts? Lauren: Metrics or tools marketers use to gauge social media marketing success greatly depends on what they define as success … and success (or failure) has to be thought of in terms of established goals, or KPIs. It’s impossible to say you succeeded ( … or failed) if you don’t have a clear idea of what you wanted to achieve in the first place. Marketer X running a social media campaign geared towards increasing Twitter followers or “Likes” on Facebook would use different tools and metrics than Marketer Y looking to increase direct brand traffic. X could look to historical fan count or simple follower count services (I’m fond of TwitterCounter.com), whereas Y would likely leverage analytics to track branded keyword searches and correlating site traffic. Merry: Right— metrics, or what to track, will vary depending on a business’s objectives. Leads to a website can be tracked and monitored via Google Analytics referral source and content insight. From there, marketers can analyze bounce rates from social media, time on site and conversions such as form submissions. There are many different ways to track success in social media, from basic to advanced tools. Marketers can also track brand mentions, another important factor, using YourOpenBook.org, a site that collates all status updates from public Facebook profiles. Lauren: Totally. Facebook Insights is essentially your one-stop shop for “all things organic” Facebook metrics. I’d recommend to anyone who is new to Facebook Pages to take the time to immerse themselves in the data served up by these reports. Remember not to focus solely on how many Likes a page has. There is a ton of rich info that’s arguably more immediately actionable than Likes alone. Likes are the big picture … take time to examine the smaller, day-to-day picture, too. Insights offers up analytics on every single post you share on your page, complete with the number of impressions, percent of feedback, etc. Best practice is to log into Insights once a week, take a look at what you posted, observe the feedback and use the data to advise what you post tomorrow. Did 43 people unsubscribe from your page the day you shared a link to Website Z? Odds are, Website Z offended your fan base, or bored them. Lesson learned: don’t share content from Site Z. Did a silly photo you posted get an astonishing 142 Likes in one hour? Assume your fans like silly photos, and consider sharing more to please them. Is there a certain percentage of impressions or feedback that is ideal? Is there an ideal fan count for brands? Lauren: So far as “ideal” impressions, feedback, and page Likes go … ideally, they’d be … really high. But in the end, it’s not feasible to think in these terms. Just as tracking metrics depends on company-specific KPIs, garnering fans and feedback is a case-by-case type thing. The numbers depend on the size of your company, the size of your target audience, and the quality of your community. It’s important to always put in effort to grow these numbers, but is there model, universal goal? Nope. Should an SMB feel like a dork because its FB community of 3k fans pales in comparison to Skittles’ 16,379,826 fans? No way, provided the 3k engage. Merry: Exactly. It’s not about the right amount of fans but having the right fans. Don’t get hung up on numbers, focus on getting users who actually like you and are willing to interact. What are some of the social media intangibles you believe are worth tracking to showcase success, and how do you track them? Merry: One benchmark to track for brand awareness is the rise of direct brand traffic to your site, which can tracked with an analytics program. Sentiment in social media is also sort of an “intangible,” and also plays a big role. Gauge the sentiment of brand mentions as you see them go by; is it swaying towards the more positive or negative end of the spectrum? Or are users becoming passive about your brand? Lauren: Definitely — tracking frequency of brand mentions (consider using Facebook search – filtering for “Posts by Everyone,” or tap into YourOpenBook.com) in tandem with sentiment can lend great insight for marketers to play around with. Is it possible to track and measure the effect that a social media campaign as a whole has on the company’s success? Lauren: Of course, but again, this depends on the company’s definition of “success.” If “success” = an increase in Facebook Likes, Insights can be leveraged to determine this. If “success” = X amount of clicks on a given Facebook ad, reports generated by the paid platform are where it’s at. Merry: And if “success” = a conversion, you can directly track traffic to your site from Facebook or other social assets. Tagged properly, marketers can track where they came in and if they converted (sales). Are there effective ways to track social media marketing in combination with other offline marketing and advertising efforts? Merry: This type of tracking can be as simple as implementing a “How did you hear about us?”-type survey, or tracking the dates of physical promotional events and correlating them with Facebook Insights (did your Facebook page get a ton of traffic the day after a party you hosted?). Lauren: Taking a super social approach to this could work, too. Building off the survey concept … the day after an event, consider starting a thread about what went down, fun highlights, post photos, etc. From there, track the engagement, increase (or decrease?) in fans, and other metrics indicative of a smash hit (or an ineffective offline effort). What advice would you give marketers who are trying to make a case for obtaining not only executive buy-in for social media but also a budget? And does a target social media budget exist? Lauren: Show them the legendary Dell-$3-Mil-in-Sales-Thanks-To-Social-Media case study. Seriously, though – there is no excuse nowadays for companies, C-suite included, to NOT consider integrating some form of social media in their marketing plans, even if all that budget does is pay an intern minimum wage to keep a finger on the pulse of brand mentions in social channels. I’d advise marketers looking for head honcho buy-in to create a compelling presentation documenting evidence that their target audience is present on Facebook, Twitter, YouTube et al., engaged in and influenced by conversations happening in these places, and receptive to outreach from brands or brand evangelists. In short: show them there’s potential for you to make friends (and conversions) via social media. Merry: If SEO is important to your executives, it stands to reason some sort of social media needs to be important to them as well. Google and Bing both have revealed social signals as impactful of organic rankings. When you take your case to the bosses, make sure your motives and goals are data-driven, rather than the same old “But everyone else is doing it!” mentality. Assess how a social media plan will fit in your long-term strategy. Can it be used to supplement or replace existing customer service? Don’t forget about competitive research. Check out your top competitors; are they making headway in social media, or will you be blazing a new trail for your industry? For businesses just starting out with social media marketing, do you recommend they bring in an expert, train staff from within or hire an outside agency? Lauren: The choice will ultimately depend on the company size, objectives, and budget. Bringing in an expert can be an awesome choice because there’s essentially no loss of productivity once the person gets the low-down on your company. However, this is contingent upon your company having the budget for a new (possibly pricey) hire. Training from within is also a nice option, because you know and trust (presumably you hired them) who will be representing your brand out there in cyberspace. But consider the fact that community manager duties and social media marketing are (ideally) full-time roles — so you can risk stretching staff too thin if you expect them to maintain their current job description in addition to this crucial day-to-day work. Hiring an outside agency has its perks; you pay other people to do the job and they do it, but remember, no one knows your company as well as you do. Merry: Another option would be to bring in an expert for a temporary period of time to train in-house employees. The in-house team will have an intimate knowledge of the company. Ccombine that with someone who is a top-shelf community manager/social marketer and it could result in a deadly awesome combination. But again, unless the in-house team is 100 percent dedicated to social, it can be hard to commit time required to be a deep community manager. If you’re hiring an outside employee/agency, what are some of the skills and qualities companies should look for in a social media marketer or community manager? Merry: Ah, the coveted social media community manager job description. Must already be engaging users in both Facebook and Twitter. Not squeamish about talking to people they don’t know. Listening is huge. Not take over their conversation, but listen and interact appropriately. Data-driven, must be comfortable reading reports and tracking with graphs (analytics). Navigating Twitter (and its APIs) and Facebook should be nearly second nature to them. Lauren: Yep. A great community manager embodies a ton of skills, most notably, they’re adaptable, calculating, available, professional and sociable. Adaptable: A brand’s voice may not be the same voice of the employee (or the employee’s agency) who is serving as community manager. Community managers that are respectful of the brand and of the community, striving to “talk as they talk,” are the ones worth having. Calculating: Great community managers are data-driven. They constantly research great content to share, profile their community for effective and purposeful outreach, and report on progress to share with the client or C-suite. Available: Conversations, positive or negative, happen on a 24/7 basis. Good community managers are armed with smartphones, wi-fi, and strong coffee — ready to take the helm whenever necessary. Professional: Community managers may be super social creatures, but they’re still employees. That means keeping a level head when the brand is under attack, being polite, not airing personal information, etc. Sociable: That’s the name of the game, isn’t it? Community managers have to be willing and able to participate in ongoing conversations with people they’ve never met. A touch of humor (so long as it’s permitted by the brand) goes a long way, too. This interview is part of the new series on the blog, “Conference Mondays,” where industry experts and conference speakers join us to talk current SEO, SEM and SMO issues in honor of upcoming search marketing events. Catch Marty Weintraub, founder of aimClear, on June 8 at SMX Advanced talking “Facebook Ads, Meet Search Ads.” And don’t miss aimClear’s Facebook Marketing Intensive course at the conference June 9. Merry Morud is an online marketing account manager at aimClear®. A recognized Facebook-powerhouse, Merry’s areas of expertise include Facebook ads, Facebook ad segments, PPC campaigns, social media audits and community management. She has spoken extensively about Facebook as a marketing tool around the country as well as on the international stage at conferences such as Search Marketing Expo (SMX). Merry also contributes regularly to aimClear blog, and stays true to her roots by sharing her wisdom at her alma mater as well as other institutions, including Lake Superior Technical College and Marshall High School. You’ll find her tweeting @merrymorud. Lauren Litwinka is an online marketing account manager and publications manager at aimClear®. Hailing from the East Coast, Lauren traveled to the Northern Midwest in 2009 to contribute her skills in community management, holistic social befriending, online journalism, copyediting, and content syndication to the aimClear team. Lauren has spoken about social media at the 140 Character Conference (#140Conf), and published organic social ranking factor studies shared internationally by aimClear. In addition to overseeing and writing for aimClear’s AdAge Power 150 online marketing blog, Lauren prides herself in being a semi-obsessive Twitterer (@beebow) and enjoys churning out live-coverage at industry conferences, including Search Engine Strategies (SES) and Search Marketing Expo(SMX), at finger-breaking speed. She is also an aspiring Microsoft Paint artist. great piece especially the notation that FBInsights can show you the “why” of losing FB fans via links to sites that offend….if only a client had known this, eh! In order to convert users on social media to buyers, we have to differentiate social media and social media marketing. Social media is a media (it is not a strategy), but social media marketing has a lot of strategies. Which means, we use marketing strategy to apply on social media. There are many ways to convert users on social media to buyers. One of the way is running contest (that’s the most effective way for my B2C customers). Whether we can convert users to buyers, it depends on what marketing strategy we use. If we failed, it is not social media fault, it is because we use the wrong strategy on social media. Once you understand this, it is not hard to convert social media to buyers. And first step to do is LISTEN to your audience. Everyone says measuring Social Media ROI is measuring the level of engagement a brand is having with it’s audience over different social media avenues. But how much of those participative audience are converted into prospects, is still a big question. I second that, I believe in making sure people doing social media for you are geared for your business. Totally agree. For ecommerce using Google Analytics conversions is a sure fire way to track the value of social media to a company. I’m also a huge believer in getting an in-house team trained up and armed with the tools to manage social media. It’s more cost effective in the long run and provides a more genuine experience. In order to measure ROI for social media, I believe best selling author Paul Gillin has an answer in his book Social Media to Business Customers.